“I feel like I live with one foot in the past and one foot in the future,” he said. That’s how a friend of mine once described his life. He went on to tell me about events of the past, lost opportunities, wounds, and regrets. There was an emptiness about him. He sounded trapped and imprisoned by his own history, things done and left undone. After that he talked about the uncertainty of his future and what might or might not be. He was scared. There were a lot of unknowns in his life. Even as he listed his hopes for what might happen and the way he wanted his life to be, he had to admit these were things he could neither control nor predict. 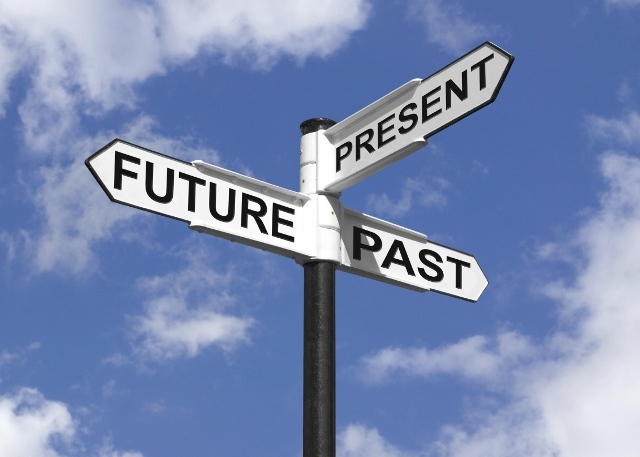 With one foot in the past and one in the future we straddle and completely miss the present. We become captive to what was, oppressed by what might be, and blind to what is. Our life is impoverished, small, and empty. We are absent to God, others, and even our selves. We are unavailable to those we love, to the needs of the world, and to the fullness of life that God offers. That is no way to live. That is not the way Jesus lives and it is not the life to which he calls us. The life Jesus offers us is a life of freedom. I’m not talking about autonomy, the ability to choose and do what we want, a life determined by individual preferences. I’m speaking of the freedom to be and become fully alive, the freedom to be and become fully human, the freedom to be and become fully Christlike. That can only happen here and now, in the present moment. Jesus neither reminisces about the past nor forecasts the future. He comes to his people in the very circumstances of their lives. That’s what he did that day in Nazareth and it’s what he does for each one of us. “Filled with the power of the spirit” and “anointed to bring good news to the poor,” he comes “to proclaim release to the captives and recovery of sight to the blind, to let the oppressed go free, to proclaiming the year of the Lord’s favor” (Lk. 4:14, 18-20). This is about my friend, about you, and about me. We are the poor, the captive, the blind, the oppressed, and the ones seeking the Lord’s favor. How we understand that about ourselves depends on our own lives and experiences. Poverty might be about money or material needs such as food, clothing, or housing. It might also be poverty of love, hope, or meaning. Regardless, our world is empty. The captive might be a prisoner, an addicted person, a cancer patient, or one overcome by anger and resentment. Regardless, our world is small and closing in. Blindness is not only physical but can also be emotional or spiritual. Regardless, our world is dark. Oppression happens in hundreds of ways from physical or emotional violence, to racism, to fear, to profound sorrow. Regardless, our world is not safe. In the midst of these circumstances, when life gets really difficult, it is easy and tempting to run away, to get stuck in the past, or fixate on the future. Yet, Jesus comes to us today, here, now. He is not lost in our past or hidden in an unknown future. The only place we can meet Jesus is today, in this present moment, in whatever the circumstances of our life might be. Today he brings good news to the poor. Today he proclaims release to the captives and recovery of sight to the blind. Today he lets the oppressed go free. Today he proclaims the year of the Lord’s favor. Here’s the irony. We too often miss today fretting over yesterday and worrying about tomorrow and yet the presence of Christ today somehow heals our past and prepares us for the future. Good news, release, sight, freedom, the Lord’s favor. All these are made real and present today, in the current context and circumstances of our lives. Those are not just things Jesus does they are the manifestation of God’s presence, life, and love with and in God’s people. They are manifestations of the freedom Christ brings. They are fulfilled, brought to fullness, in our hearing. To the extent we are unable to hear Jesus’ words we are either stuck in the past or living in a future we do not yet have. Hearing is about more than sound. It is about our presence, openness, and receptivity. We must be willing to take into ourselves the reality and truth of what is spoken. We must also be willing to take into ourselves the life and presence of the one who is speaking. Jesus is not just speaking words. He is speaking new life. In his speaking and our hearing his life and our life become one life and it is happening today. The above sermon is based on Luke 4:14-21. The collect and readings for the day, Epiphany 3C, may be found here.